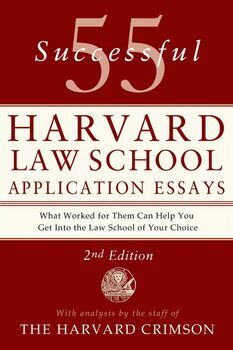 Fifty-five all-new essays that got their authors into Harvard Law School with analysis showing what worked, what didn't, and how you can do it, too. Harvard Law School is the premier law school in America. It as well as other top schools draw thousands of applicants from the best colleges and best companies from around the world. As the admissions departments become more and more selective every year, the competition becomes even fiercer, and even the best and brightest need an edge.